Whether you’re simply looking to be more informed prior to filing a VA Disability claim, your initial claim has been denied or doesn’t seem to match what you’ve lost due to your disabling injury or illness, or you’re looking for legal representation for Condition-Specific VA Disability Claims, Bluestein Attorneys is here to help. Our SC Veterans’ Advocates team is made up of military veterans themselves, who understand the unique stressors and pressure of military life. We’re not only passionate about representing the rights of military veterans, we’ve got what it takes to fight alongside you. The Bluestein Attorneys VA Disability Team is here to help. Condition-Specific VA Disability claims make up a significant percentage of all claims filed, and it’s often a good idea to get a closer look at the various conditions, injuries, and illnesses that fall into this category. To find more information on each individual type of condition-specific VA Disability claim, just click on the row below. From 1962-1971 the U.S. military sprayed millions of gallons of Agent Orange and other herbicides over the vegetation of Vietnam during “Operation Ranch Hand.” The purpose behind the use of Agent Orange and other herbicides was to defoliate the vast vegetative cover that enemy troops relied upon to mask their location and movements. Many soldiers displayed chronic disabilities upon returning home that have since been linked to Agent Orange. For a long time, the VA and the U.S. Government did not recognize the alarming nexus between Agent Orange and the widespread ailments. Congress finally passed the Agent Orange Act in 1991. At Congress’s direction, the VA has determined that veterans who can show that they served in areas which were exposed to Agent Orange or other herbicides are allowed presumptive service connection for a list of specific health problems. Under a presumptive service connection, a veteran simply has to show that they have specific diseases which the VA has already determined are caused by exposure to Agent Orange; and that he was exposed to Agent Orange. The VA has also determined that service in certain places during specific time periods will automatically prove exposure to Agent Orange. What Health Problems Are Presumed Caused by Agent Orange? Lou Gehrig’s Disease – the presumption for Amyotrophic Lateral Sclerosis (ALS), or Lou Gehrig’s disease, extends to all veterans who had 90+ days of continuous active duty service. Nehmer Class Members: Veterans who were exposed to Agent Orange, or other herbicides, are called Nehmer class members. This name comes from a class action lawsuit filed against the VA by the NVLSP on behalf of Beverly Nehmer and other exposed veterans. Nehmer class members have special rules for issuing an effective date, proving exposure, and proving nexus. Additionally, benefits due to Nehmer class members have special rules for who can collect benefits that are due upon the death of the veteran. Proving Exposure : Veterans can prove exposure to Agent Orange a number of ways. The first way is to actually show, through competent evidence, that the veteran was exposed to Agent Orange or other herbicides. The Agent Orange Act directed that certain veterans can prove exposure by showing service in specific locations. The most common is service in Vietnam, but other places also qualify. Vietnam: The “service in Vietnam” condition is met if the veteran can show that he set foot on land in Vietnam during the applicable time period. This could include short-term trips ashore or long-term tours in-country. In addition, veterans who served on ships in inland waterways in Vietnam, or “Brown Water” Navy veterans, qualify for the presumption. Veterans who served on ships off the coast of Vietnam, or “Blue Water” Navy veterans, do not qualify for the presumption. They must show that they set foot on land in Vietnam or served in an inland waterway in order to benefit from the presumption. The VA maintains an ever growing list of Blue and Brown Water Navy ships at http://www.publichealth.va.gov/exposures/agentorange/shiplist/list.asp. Blue Water veterans who do not qualify for the presumption can still claim service connection related to Agent Orange exposure, but they must show evidence that they were exposed to a herbicide. Korea: Veterans who served near the Korean demilitarized zone (DMZ) at any time between April 1, 1968, and August 31, 1971, may benefit from the Agent Orange/herbicide exposure presumption. Thailand: The military used herbicides around military bases in Thailand during the Vietnam conflict. For veterans who served on or near the perimeters of military bases in Thailand between February 28, 1961 and May 7, 1975, the VA has granted special consideration for exposure to Agent Orange and other herbicides. For U.S. Air Force veterans who performed specific duties at a list of various Thai Air Force bases, herbicide exposure is presumed. This also applies to U.S. Army veterans who served on a Thai air base who were involved with perimeter security duty, although Army veterans require additional credible evidence to prove they served in this duty capacity. Other Exposures: Agent Orange and other herbicides were tested or stored in many locations, many within the United States. The VA website has a list of dates and locations of herbicides tests and locations provided by the Department of Defense. C-123 Provider aircraft were used to spray Agent Orange and other chemicals during Operation Ranch Hand. Some veterans who served on such aircraft after they were used for this purpose have raised concerns about possible herbicide exposure. The VA has concluded that the potential for exposure and thus long-term health effects is minimal. Nehmer Effective Date Rules: The VA also has special rules for assigning the effective dates for Agent Orange conditions. These rules are very generous, and are the result of a very long and protracted lawsuit between the VA and veteran organizations. Generally, these rules are applied when a new condition is added to the list, or a veteran is finally able to prove exposure to Agent Orange. In addition, there are special rules for deceased Nehmer class member. These special rules allow any unpaid benefits to pass to the surviving spouse, any child of the veteran, the veteran’s parents, or to the veteran’s estate. The normal rules on unpaid benefits at death limit payment to a surviving spouse or dependent child or dependent parent. Children With Birth Defects: Children of veterans who served in the Vietnam or Korean conflicts with spina bifida or other birth defects may be eligible for VA benefits. More information can be found on the VA website. Please visit our comprehensive PTSD page for more information. Military sexual trauma (MST) is the term used to describe any sexual activity in active duty where someone is involved against his or her own will. Veterans who experienced MST may develop PTSD related to sexual trauma or other mental health conditions. If you were sexually traumatized while in active duty, you are entitled to counseling and other services provided through the VA, free of charge. In addition, PTSD or another mental condition which was caused by MST will constitute a service connected mental health condition which the veteran can seek benefits for. 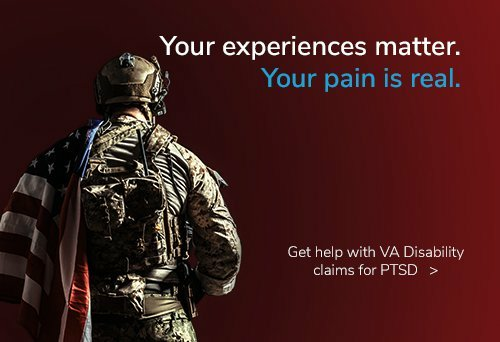 Recognizing the absence of service records related to sexual trauma, the VA will accept non-traditional evidence to support the assault. statements from family members, roommates, fellow service members, or clergy. or unexplained economic or social behavior changes. Many veterans are faced with daunting mental health problems caused by their military service which they have to deal with for many years after their discharge. Generally, mental health problems are not given the attention they deserve. It is very important that veterans and their families ensure that they seek professional help for any mental health problems they feel they may have. The VA offers a cadre of services and programs with mental health issues, including inpatient/outpatient care, counseling, PTSD Group Therapy, Psychosocial Rehabilitation and Recovery Centers, Vet Centers providing readjustment counseling for veterans returning from deployment, and many more. In addition, the VA offers treatments such as medications, talk therapies, and psychosocial rehabilitation and recovery services. The VA pays disability benefits for service-connected mental health problems. A veteran who feels that they have a service connected mental health issue should see a mental health professional who can give a diagnosis and determine whether or not the problem is connected to the veteran’s military service. Mental health disabilities can also be linked to a veteran’s service connected disabilities. Often, the impact of very severe disabilities can cause depression. In this case, a veteran can get service connected for depression that is caused by already service connected disabilities. Many veterans who have served in the Southwest Asia Theater of operations, commonly known as the Persian Gulf, have displayed a combination of medically unexplained chronic symptoms which has been called “Gulf War Syndrome,” although the VA dislikes that terminology. These symptoms have included fatigue, headaches, joint pain, indigestion, insomnia, dizziness, respiratory disorders, and memory problems. Undiagnosed illnesses with symptoms that may include: abnormal weight loss, fatigue, cardiovascular disease, muscle and joint pain, headache, menstrual disorders, neurological and psychological problems, skin conditions, respiratory disorders, and sleep disorders. The symptoms must be at least 10% disabling for the veteran to qualify for the presumption. Infectious Diseases: The VA has also determined that some infectious diseases are presumptively related to military service in the Persian Gulf, as well as Afghanistan. Malaria – must be at least 10% disabling within one year of military separation date or at a time when standard treatises indicate that the incubation period began during qualifying period of military service. Bucellosis – must be at least 10% disabling within one year from date of military separation. Campylobacter Jejuni – must be at least 10% disabling within one year from date of military separation. Coxiella Burnetii (Q Fever) – must be at least 10% disabling within one year of the date of military separation. Nontyphoid Salmonella – must be at least 10% disabling within one year of the date of military separation. Shigella – must be at least 10% disabling within one year of the date of military separation. West Nile Virus – must be at least 10% disabling within one year from the date of military separation. Gulf War Registry Health Exam: Veterans who have served in the Southwest Asia Theater are eligible for a free Gulf War Registry Health Exam provided by the VA. The purpose of the exam is to alert veterans to possible long-term health problems that may be related to environmental exposures during their service in the Gulf. Veterans who feel that their service-connected disabilities leave them “totally disabled” and/or prevent them from working can seek the Individual Unemployability benefit. Total Disability due to Individual Unemployability (TDIU) is granted to veterans who are considered to be totally disabled due to their service-connected conditions, yet who may not have a full 100% rating. You must be unable to maintain substantially gainful employment as a result of service-connected disabilities (marginal employment is not considered substantial gainful employment). You must have two or more service connected disabilities where at least one disability is rated at 40% or more, and there is a combined rating of 70% or more. However, even if you don’t have disabilities rated this high, you may still obtain TDIU if your service connected disabilities prevent you from working. Veterans who are seeking TDIU should be aware that the benefit can only be granted based on service-connected disabilities. Age, non-service connected disabilities, and residuals of non-service connected disabilities cannot be considered when determining whether a veteran should be granted TDIU. Many veterans from the Iraq and Afghanistan conflicts have suffered Traumatic Brain Injury (TBI), which is a form of acquired brain injury where sudden trauma causes damage to the brain. Soldiers in combat can sustain TBI by blast exposure, sudden blunt force trauma to the head, or foreign objects hitting the head and piercing the skull. Many veterans have sustained TBI in non-combat situations while in service, such as in motor vehicle accidents, other accidents, sports and falls. The VA instituted a new rating schedule for TBI in October 2008; the prior rating schedule was deemed to be completely inadequate to compensate for disabilities resulting from TBI. The new rating schedule applies to all VA claim filed after October 22, 2008; however, the old rating criteria still apply to claims filed before that date. Mental Disorders: Traumatic Brain Injury often occurs at the same time as mental health disabilities, which are evaluated under the “emotional/behavior residuals” category. For mental health conditions which do not rise to the level of a separate mental disorder, they are simply evaluated under this category. However, veterans with TBI and diagnosed mental health disabilities will receive a separate rating for that mental health disability. Special Monthly Compensation for TBI: Veterans with TBI may be eligible for an additional Special Monthly Compensation monetary benefit if, due to TBI residuals, the veteran is in need of aid and attendance, and would require hospitalization, nursing home care, or other residential institutional care in the absence of regular in-home aid and attendance. Special monthly compensation is paid to compensate veterans for service-connected disabilities that involve anatomical loss or loss of use, such as loss of use of a hand or a foot, or impairment of the senses, such as loss of vision or hearing. While the basic rates of compensation are predicated on the average reduction in earning capacity, special monthly compensation benefits are based on noneconomic factors such as personal inconvenience, social inadaptability, or the profound nature of the disability. In addition to the conditions described above, a veteran can also receive special monthly compensation under the Aid and Attendance or Housebound rates. The veteran requires the aid of another person in order to perform personal functions required in everyday living, such as bathing, feeding, dressing, using the restroom, or using prosthetic devices. The veteran is bedridden, where his disability or disabilities requires that the veteran remain in bed separate from any prescribed course of treatment. The veteran’s eyesight is limited to a corrected 5/200 visual acuity or less in both eyes, or has concentric contraction of the visual field to 5 degrees or less. A surviving spouse may also be eligible for the Aid and Attendance Benefit if they meet one of the qualifications. Housebound Benefit: A veteran or veteran’s survivor may be eligible for the additional Housebound Benefit if they are substantially confined to their immediate premises due to permanent disability caused by service connected disability. A veteran or veteran’s survivor cannot claim both the Aid and Attendance Benefit and the Housebound Benefit at the same time. Many veterans have been exposed to radiation during their military service. Potential sources for radiation exposure during military service include: nuclear weapons handling and detonation, weapons and other equipment made with depleted uranium, radioactive material, calibration and measurement sources, and x-rays. Veterans with MOS’s which required frequent interaction with such sources (such as veterans serving on a nuclear submarine, or as an x-ray or dental technician) may be at risk for radiation-related diseases. Most concern about radiation exposure is about ionizing radiation, which is high energy. Other sources such as sunlight, microwaves, radio, radio, and sonar emit low-energy radiation, or non-iodizing. Some veterans are eligible for a free Ionizing Radiation Registry Health Exam. Veterans who were involved in a Radiation-Risk Activity (see below) are entitled to a presumption of service connection for certain cancers which have been linked to exposure to ionizing radiation. Cancers of the bile ducts, bone, brain, breast, colon, esophagus, gall bladder, liver (primary site, but not if cirrhosis or hepatitis B is indicated), lung (including bronchiolo-alveolar cancer), pancreas, pharynx, ovary, salivary gland, small intestine, stomach, thyroid, urinary tract (kidney/renal, pelvis, urinary bladder, and urethra). Multiple myeloma (cancer of plasma cells). Participated in occupation of Hiroshima and Nagasaki, Japan between August 6, 1945 and July 1, 1946. Were prisoners of war in Japan during World War II. Participated in atmospheric nuclear weapons tests conducted mainly in Nevada and the Pacific Ocean from 1945 to 1962. Atomic Veterans who have one of the above listed cancers are presumed to be service-connected. Veterans who were involved in underground nuclear weapons testing at Amchitka Island, Alaska prior to January 1, 1974 are considered to have engaged in Radiation-Risk Activity. In addition, veterans who were involved in underground nuclear weapons testing for at least 250 days before February 1, 1992 at Paducah, KY, Portsmouth, OH, or K25 in Oak Ridge, TN are also considered to have been in Radiation-Risk Activity. Veterans involved in such underground nuclear weapons testing who have one of the above listed cancers are presumed to be service-connected. Other diseases not listed will also be considered by the VA for service-connection on a case-by-case basis. Factors considered include length of time exposed to radiation, severity of radiation, length of time between exposure and manifestation of the disease, and more. U.S. Coast Guard veterans who worked at a Long Range Navigation (LORAN) station from 1942-2010. McMurdo Station, Antarctica nuclear power plant from 1964 to 1973 – VA and DoD are still determining whether radiation exposure at McMurdo may have caused cancer in veterans. Nasopharyngeal (nose and throat) radium irradiation treatments from 1940 to mid-1960s – some pilots, submariners, divers, and others were given this treatment to prevent ear damage from pressure changes. Radiation therapy – for treatment or diagnosis of cancer or other diseases. RECA is not available for members of the military who occupied Hiroshima and Nagasaki. For veterans who are onsite participants, RECA is available for the same listed conditions as for presumptive service connection. RECA may be a better alternative if the veteran is very old, or has already passed. RECA can be paid to the veterans surviving spouse or other surviving family members. However, any VA compensation paid for the same disability will be offset from the RECA award. Bluestein Attorneys Blog: Can I Have PTSD if I Was Never in Combat? Bluestein Attorneys Blog: Can the VA Reduce My Service-Connected Disability Benefits? Are you searching for VA Disability attorneys? You can request a FREE VA Disability consultation with Bluestein Attorneys just by giving us a call at (803) 779-7599 or by filling out the form on this page.